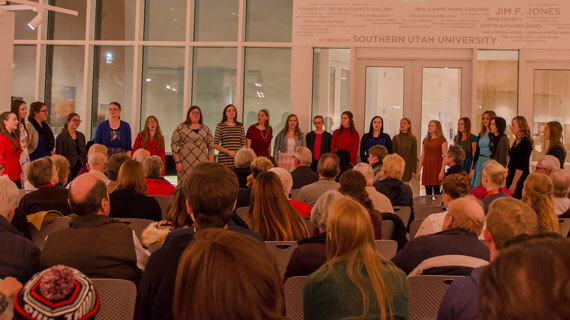 The Great American Songbook Series moves headfirst into the Spring semester with their third concert on Tuesday, February 13, 2018, in the Southern Utah Museum of Art (SUMA) at 7:30 p.m. Students and faculty from SUU’s Department of Music will perform the songs of American legend Johnny Mercer. Ticket prices are $10 for adults and $5 for students. Johnny Mercer, born in 1909, was introduced to Broadway in the 1930’s. Not only was he a lyricist, but he also composed and performed pop hits as well. He served as founding president of the National Academy of Popular Music (now Songwriters Hall of Fame). His work continued through the 1970’s until his death in 1976. Dr. Lawrence Johnson, Chair of the Department of Music at SUU, said, "The Great American Songbook Series has been a welcome addition to the concert season of the SUU Department of Music. Students have gained a new appreciation for American composers and lyricists, and audiences have the opportunity to hear so many of their favorite hits from the Golden Age of song! The Department of Music is extremely grateful for all the donations which support the students in the department through these concerts. So be sure to add us to your musical arts calendar and we hope to see you joining us in celebrating our rich history of American songs!" Travel through the ages with the music of Johnny Mercer. For more information about the Department of Music at Southern Utah University, please visit www.suu.edu/pva/music.